In my first article on the 1978 occupation of Bastion Point, near Auckland, I wrote of the extensive communist backing behind the Maori protesters. I showed some of the influence of the Socialist Unity Party, the Socialist Action League and the Communist Party. The Communist Party was then a tiny, pro-Albanian splinter group. I've always regarded them as minor players and the SUP as the major player in the 506 day occupation. The Communist party eventually morphed into a Trotskyist organisation-Socialist Worker. In the June 2006 issue of SW's "Unity", Len Parker, a veteran of the Communist Party and Socialist Worker, gives his very different version of events at Bastion Point. According to Parker, the Communist Party, particularly comrade Jimmy O'Dea, was the main driver of the occupation. I'm going to tell the largely untold story of the significant contribution to the struggle made by the organised working class. 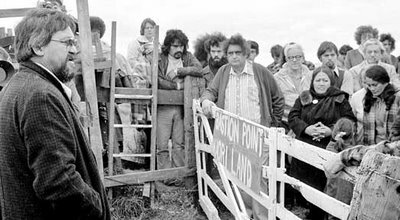 ...Auckland leaders of the Communist party met with the Orakei Maori Action Committee for authorisation to approach workers to win support for the land occupation and the Green Ban. Jimmy O'Dea and Trent Richards led the Communist's practical work in this campaign, which involved some 40 party members at its height. The Orakei Maori Action Committee elected Jimmy O'Dea and Willy Pirama to call meetings with industrial workers all around Auckland. A priority was talking to staff at Wilson Rothery, contracted to build roads through the Bastion point sub-division. With backing from their Maori job delegate, Bill Abraham, Wilson Rothery workers voted to support the green ban and refuse to open up the land. They also offered financial support to the occupiers. Without road builders, little else could be done at bastion Point. Another early meeting was arranged with NZ Breweries workers through their walking delegate Tom McClintock(an SUP member). Occupation delegates visited the brewery along with trades council officials. Workers pledged financial support to the occupation, levying themselves $2 each per week. This practical alliance between workers and Maori delivered the occupation's Meeting House. Jimmy O'Dea asked his friend, Irish activist, Alfie Byrne (an H Block/Armagh supporter), to approach Irish contractors, Green&McCahill with a $100 tender to remove a large wooden warehouse in Wiri. The leftwing Bower brothers who operated a small trucking firm, loaned their vehicles to transport the demolished warehouse to Bastion point. Whichever version is most accurate, it is clear that Marxism-Leninism was right there behind the Maori struggle. As it always has been.